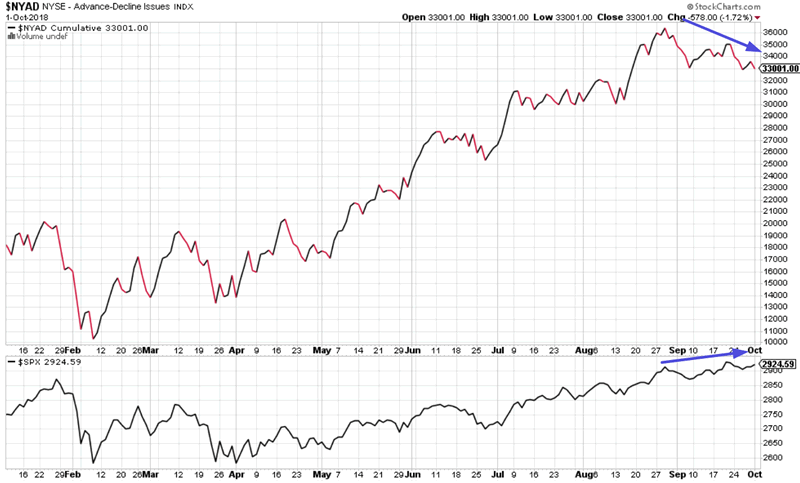 The U.S. stock market has made a breadth divergence recently. 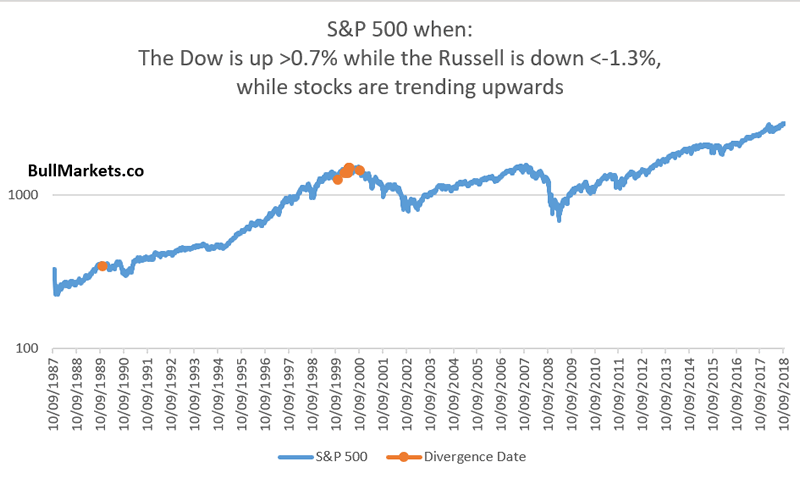 We examined the S&P 500’s breadth divergence yesterday. While this isn’t necessarily bearish, there are a cluster of signals in 2007 (near the previous bull market’s top). We are seeing more and more of a breadth divergence. This is uncommon. The last time this happened was at the height of the dot-com bubble (1999-2000). Leading up to 1999, “old economy” Dow stocks lagged significantly while “new economy” upstarts soared. But from 1999-2000, “new economy” tech stocks sank while “old economy” Dow stocks outperformed. 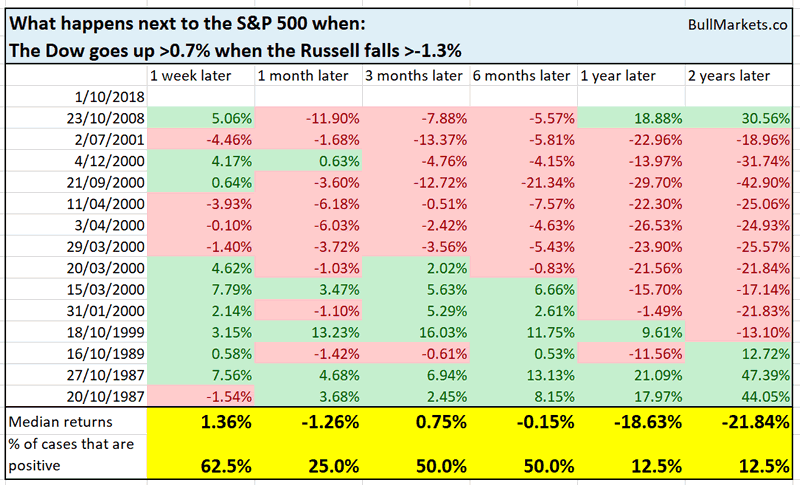 This is what happens next to the S&P 500 when the Dow is up more than 0.7% while the Russell is down more than -1.3%. As you can see, historical cases are either at the top (before a big correction / bear market, i.e. 1989 and 1999-2000), or at the bottom of a massive decline (October 1987 and 2008). 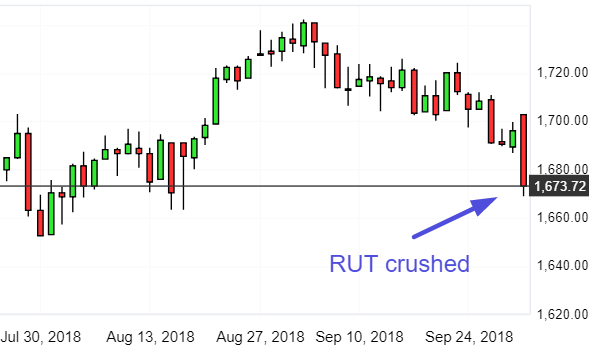 Since the stock market has not made a massive 30%+ decline recently, we can focus solely on the cases in which this kind of Dow vs. RUT divergence happened at the top. Here are the bearish divergences during an uptrend mapped onto a log-scale chart of the S&P 500. Here are the 1989 and 1999 cases in detail. October 1989. 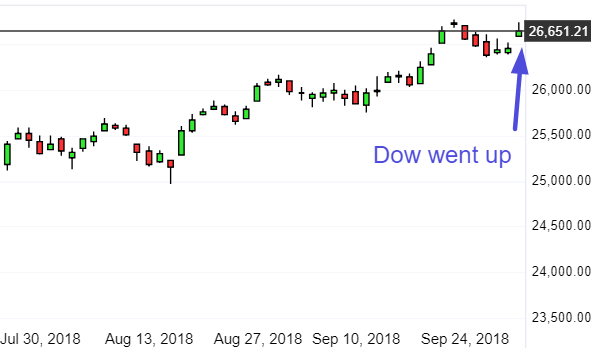 The S&P began a “big correction” 9 months later. October 1999. 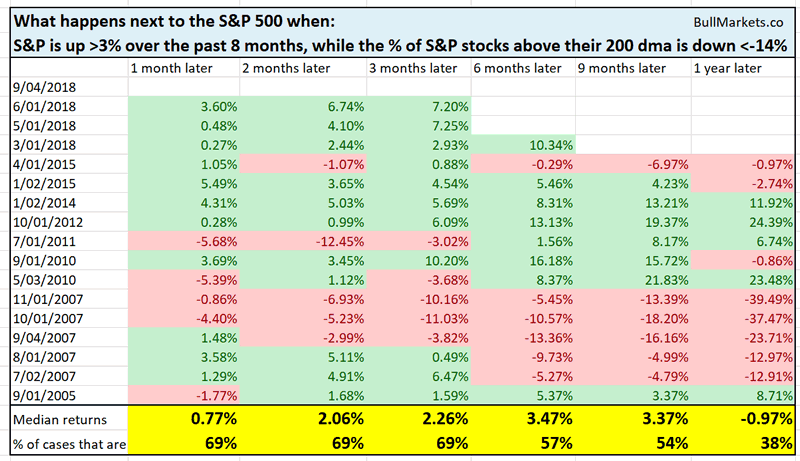 The S&P’s bull market topped 6 months later. So our story remains the same: bull market rally into 2019, and a major top somewhere in mid-2019. This is similar to projections from the Medium-Long Term Model and the Long Term Risk Model. And lastly, I’d like to note the NYSE Advance-Decline line. In previous studies I’ve demonstrated that the Advance-Decline line always makes a breadth divergence before bull market tops. This is how we knew that January 2018 wasn’t the top. The Advance-Decline Line constantly make new highs from April-August, thereby leading the U.S. stock market higher. However, the U.S. stock market is now trending higher, but the Advance-Decline Line isn’t. These bearish divergences can last for months/years. It’s not a timing tool, but it is a necessary requirement before a bull market can end. This necessary requirement is now being checked off. *The NYSE Advance-Decline line follows the Russell 2000 index. This suggests that small caps will underperform large caps during the remainder of this bull market.